Bathtub faucet drips are annoying and sometimes destructive. Dripping water can lead to corrosion and staining caused by sediments and treatments. Additionally, a bathtub faucet drip can waste water and raise your bill. Fixing the drip can save you money and help put an end to the aggravation. The three most common types of tub faucets are disc, ball, and compression, and each is fixed differently. Save money by repairing bathroom faucet drips yourself. Turn off the water supply at the shutoff valve, usually located under the bathtub. Unscrew the handle to expose the cap. Unscrew or pry off the cap (depending on your faucet model). This gives you access to the mounting screws. Remove the mounting screws, using the appropriate screwdriver. Replace the inlet and outlet scales (small washers) and pry off and replace the black O-ring from either the lower disc or the spout threading (depending on faucet model). Reassemble your faucet, turn on the water supply and run the faucet to test for dripping. Turn off the water supply at the shutoff valve. Unscrew the handle and remove the cap. Lift off the spout to expose the cam and seals. Remove the cam and pull the cam washer out. Replace the ball, inlet seals and springs. Reassemble the faucet, turn the water back on, and test for dripping by turning the faucet on and then off. Pry off the index cap with a Phillips-head screwdriver. Remove the exposed handle screw. Remove the handle to expose the retaining nut. Use the adjustable wrench to unscrew the retaining nut. Pull out the threaded stem to expose the O-ring and stem washer. Replace the O-ring and washer. 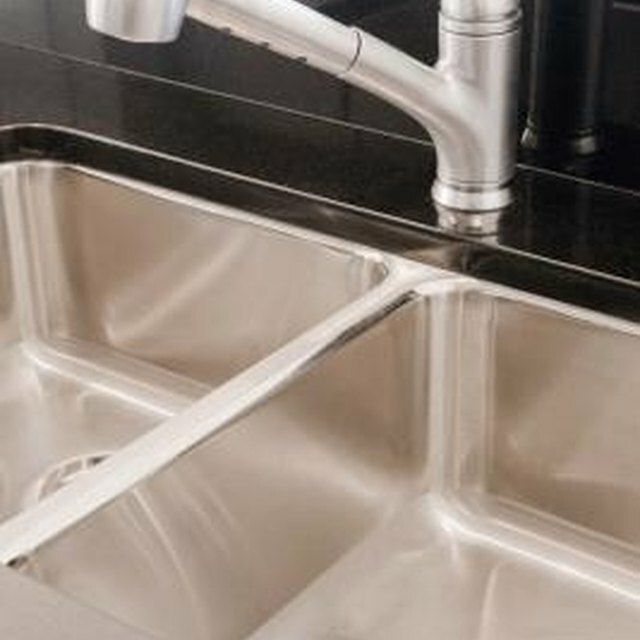 Reassemble your faucet and test for dripping by turning the faucet on and off after you turn on the water supply. Use needle-nose pliers to help remove small parts. Replace any worn or cracked parts to avoid future leaks.